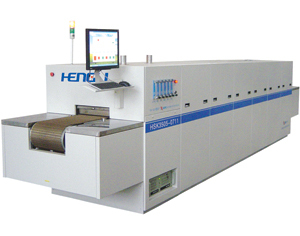 For processing of Dye Sensitized Solar Cells, this sintering furnace allows the titanium dioxide nanocrystals to melt partially together in order to ensure electrical contact and mechanical adhesion on the glass. FEC (fully enclosed coil) heaters are located on the top and bottom of the process chamber. The furnace is integrated with clean stainless steel muffle and nitrogen atmosphere distribution system. Fast thermal response; Uniform and stable temperature control; Energy efficient; Perfect for Dye Sensitized Solar Cell processing.